Meanwhile, in 10-inch nonstick skillet, melt butter over medium-high heat. Cook mushrooms in butter 6 to 8 minutes, stirring occasionally, until tender and browned. In large bowl, mix cooked spaghetti, mushrooms, chicken, soup, sour cream and pepper. Pour mixture into baking dish. Sprinkle with cheese. Bake 40 to 45 minutes or until bubbling on edges and completely heated through. Let stand 5 minutes before serving. Sprinkle with parsley. Somewhat like a white-sauce version of a spaghetti casserole, this tetrazzini version is a great core recipe to use up leftover chicken, turkey or chopped ham. It’s important to sauté the mushrooms before stirring them into the rest of the ingredients—they release a lot of water as they cook, so precooking them cooks off their extra moisture plus concentrates their flavor. Finish the creamy pasta with a generous sprinkle of chopped parsley, or really bump up the flavor with fresh oregano or thinly sliced basil leaves. Way back at the turn of the last century, Luisa Tetrazzini was a famous opera star. The Italian soprano was famous all over the world, known for her lyric-coloratura parts. She was also known for her discerning taste and hearty appetite. After touring in Italy, Russia, Spain and South America, she made her American debut in San Francisco in 1905. In her honor, the chef at the Palace Hotel in San Francisco, California, named his signature baked chicken dish, chicken tetrazzini, after her. We wouldn’t be surprised if you wanted to burst into song after one bite of this hearty, filling and easy dinner. 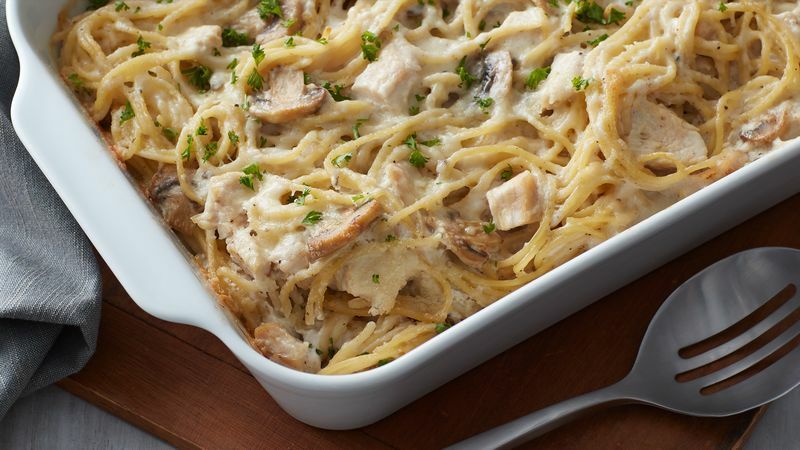 Once you’ve tried this easy chicken tetrazzini casserole, you can find more traditional favorite recipes, intriguing variations and fresh new takes in Betty’s Best Chicken Tetrazzini Recipes.